Microsoft has a major investment into their Public cloud offerings. These cloud services have been around for several years, and are hosted in Microsoft datacenters across the world. These two clouds are different and distinct from each other, in terms of: Services offered, Subscriptions, Pricing, and SLAs. 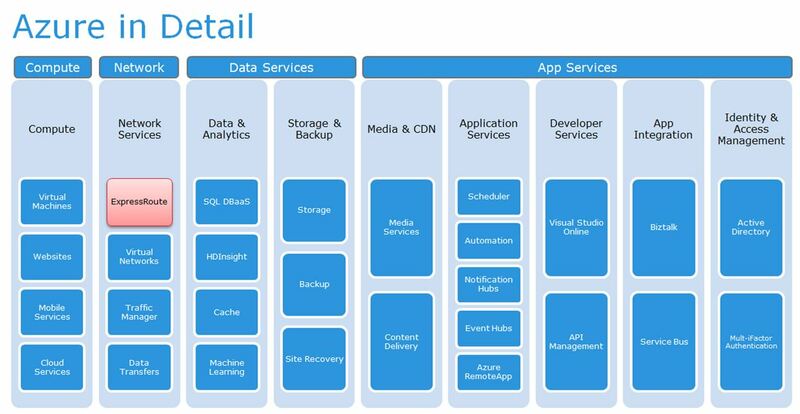 Microsoft Azure includes: Infrastructure as a Service, Platform as a Service. These services are such as, Compute (virtual machines), Networking, Cloud storage, SQL and Web services, Application services, Developer services, just to name a few..
Microsoft Office 365, is: Software as a Service. Office 365 is different from Azure and is end-user focused. Office 365 includes services such as, Exchange Online, SharePoint Online, Lync, OneDrive, just to name a few. Most importantly, Office 365 (in the higher subscription tiers) includes a full copy of Microsoft Office for local deployment. Office typically represents the largest share of a customer’s investment in Microsoft licensing. Specifically Microsoft Azure is broken in various service categories. All these services run in a Public multi-tenet infrastructure which is hosted in Microsoft datacenters located globally. Each customer’s subscribed services are virtually provisioned and virtually isolated from other tenets. ExpressRoute is an Azure networking service. Microsoft began offering this service in early 2014. 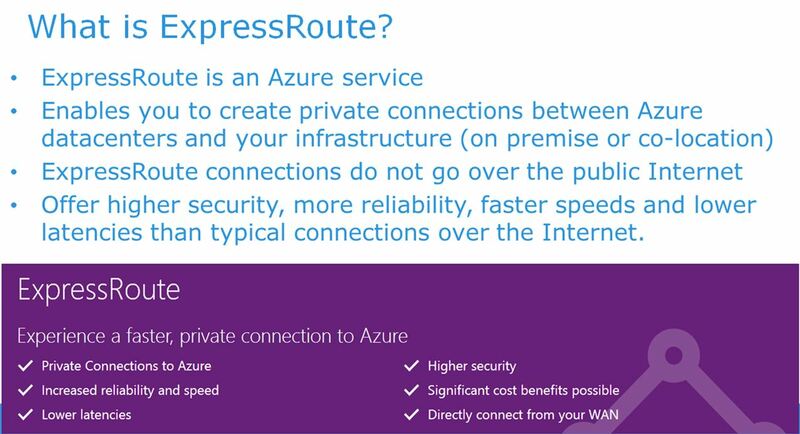 The ExpressRoute service provides a direct connection into Azure. This connection is either from the customer’s private data center or a service provider’s co-location facility. The ExpressRoute connection traverses private connections and does not go over the Public Internet. Each customer’s traffic over ExpressRoute is isolated and secured from other customer’s traffic. As a result of developing the ExpressRoute service, Microsoft has addressed it’s customer’s reluctance to moving workloads into Azure. Since ExpressRoute creates a private direct path into Azure, it enables the deployment of a hybrid-cloud with on premise Hyper-V.
EMC’s interest in ExpressRoute is because it enables workloads to move to Azure and still leverage on-premise EMC storage. 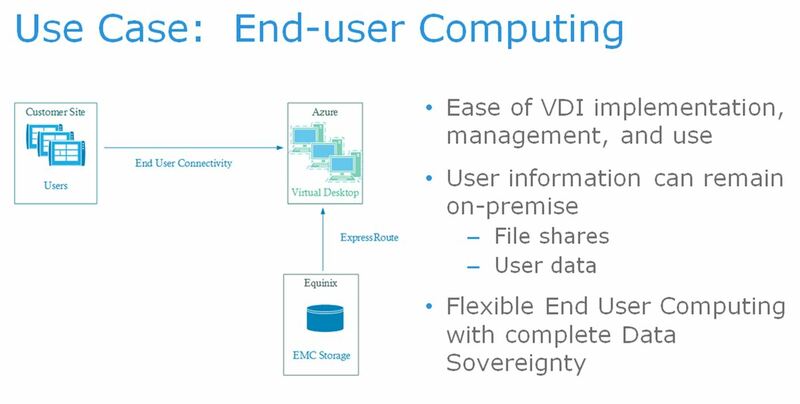 This allows EMC to deliver value and open the door for additional EMC opportunities. Exchange providers have a co-location datacenter where the customer’s equipment is hosted. This equipment is accessible both from Azure and the customer’s network. 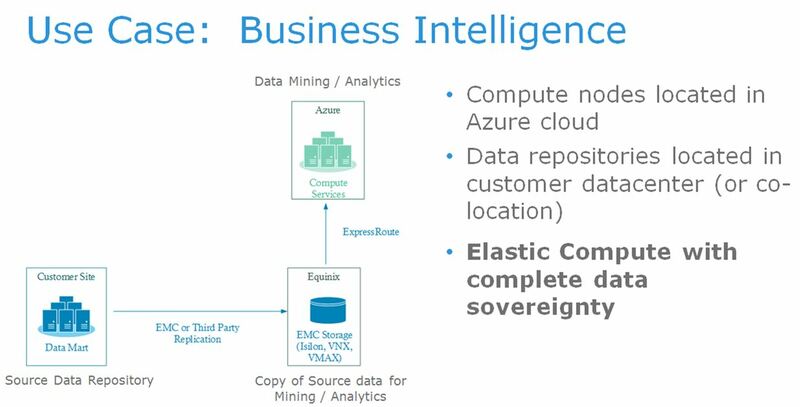 This model allows for unlimited data ingress into Azure, however it does have a tiered subscription plan for data egress out of Azure back to the co-location site. Egress traffic over and beyond the subscribed plan will result in additional charges per GB. Network Service providers only offer network services from the customers datacenters directly Azure. This allows for the customer’s equipment to stay in their own datacenter. This model allows for both unlimited data ingress and egress to/from Azure. The network connection is a virtual connection (VPN) from the customer’s datacenter. There are two separate sets of charges for leveraging ExpressRoute. Charges from Microsoft are different between the two models. The Microsoft charges are significantly less for utilizing an Exchange provider, however there are data egress caps. The charges from the service providers are in addition to the Microsoft charges. 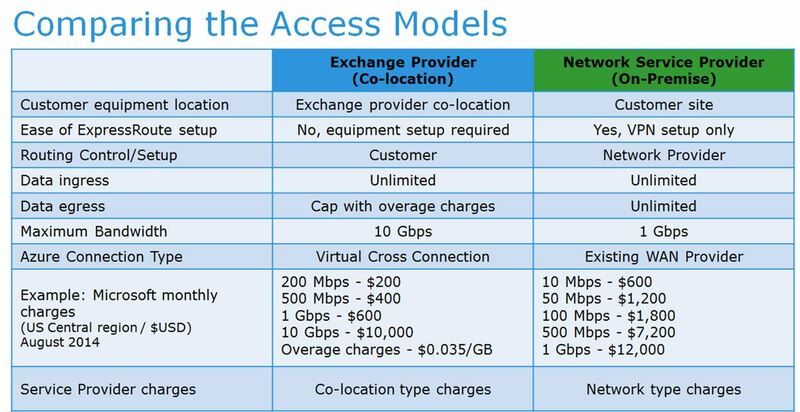 This chart shows a quick comparison of the two different provider models. 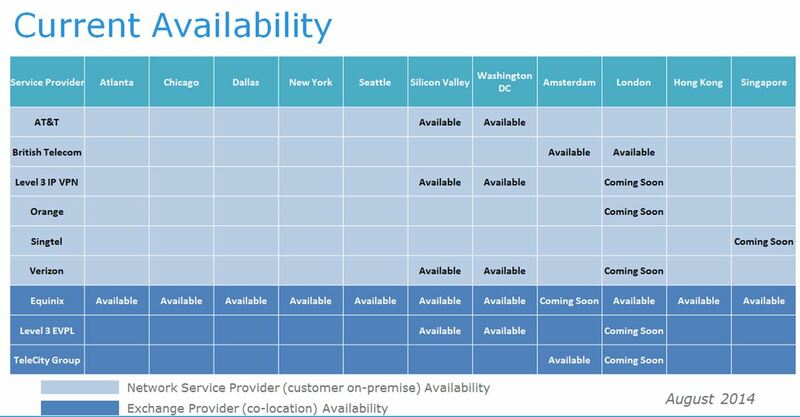 As you can see by this service availability chart that there is limited Network Service provider locations. Additional access points will be added over time as the service matures. As far as Exchange Providers, Equinix has the most locations available. EMC has partnered with Equinix to offer EMC equipment and services in the Equinix facilities. 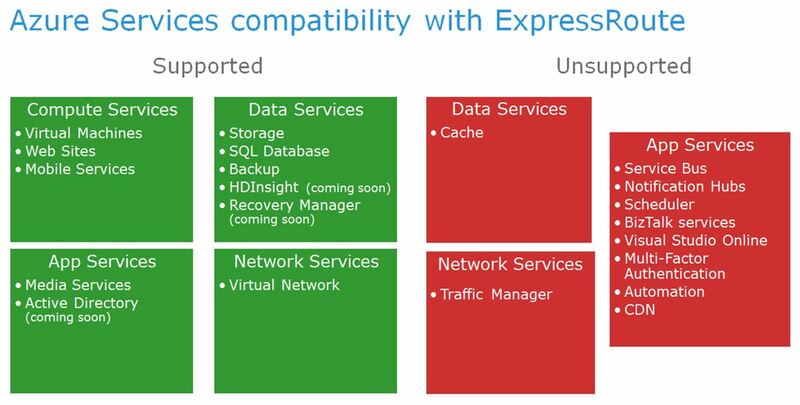 Not all of the Azure services are supported by ExpressRoute. Specifically, many of the App Services are not supported. These services are primarily “Platform as a Service” services. Microsoft is wanting new application development to remain in their cloud. There are several pre-requites for each Service Provider model. The relationship to either an Exchange or a Network Service Provider is independent of the relationship with Microsoft. Separate contracts and pricing will be established with Microsoft and the Providers. The technical pre-requites are detailed on Microsoft’s website and vary between the two models. By having a private and secure connection to Azure, the data will be protected with encryption. The data also can reside in the customer’s data center and retain any existing data control measures. 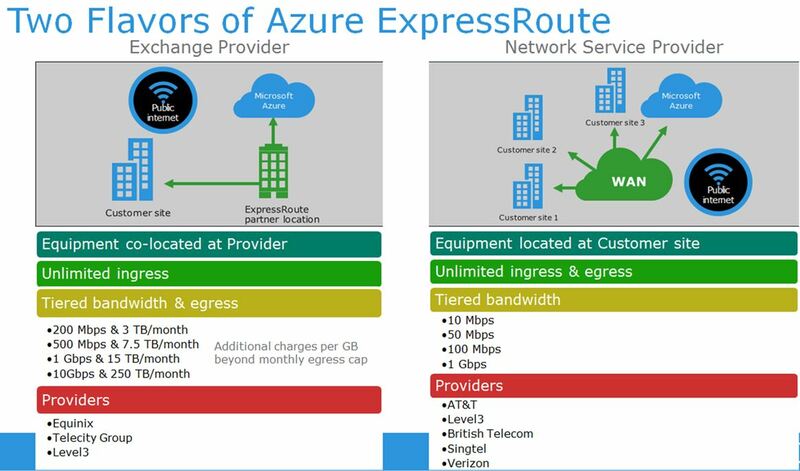 ExpressRoute implements dual-redundant connections between the customer site and the Azure cloud. 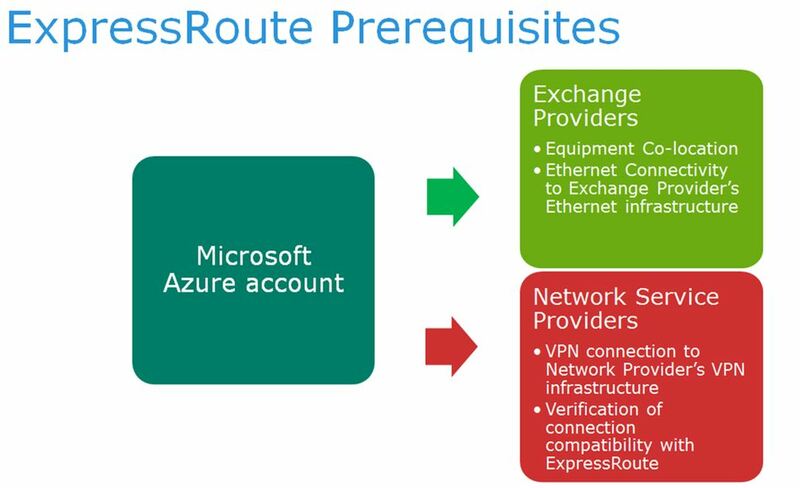 ExpressRoute also eases the implementation of Azure for D/R by creating the private connection that is always on and available. By having Compute in the cloud and retaining the Data on-premise, the Data can be protected by existing Backup methods and policies. 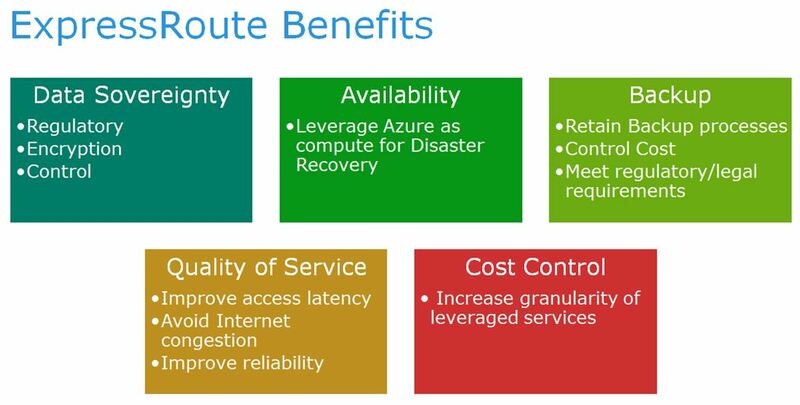 By Expressroute not utilizing the Public Internet and with Service provider SLA’s, the customer can be assured of improved performance and lower latencies from Azure back to the On Premise resources. Microsoft Azure is a pay-as-go pricing model. Only the services utilized are billed. This is very attractive for D/R scenarios where the stand-by servers are either warm (up and running) or cold (power-down VMs). The cold machines are not charged until they are powered on. This first use case of Azure’s ExpressRoute that I would like to detail is “DR as a Service”. In the depiction, you will see the production data is at the customer’s location with the Disaster Recovery Site split between a co-location Exchange provider, in this case Equinix and Azure. 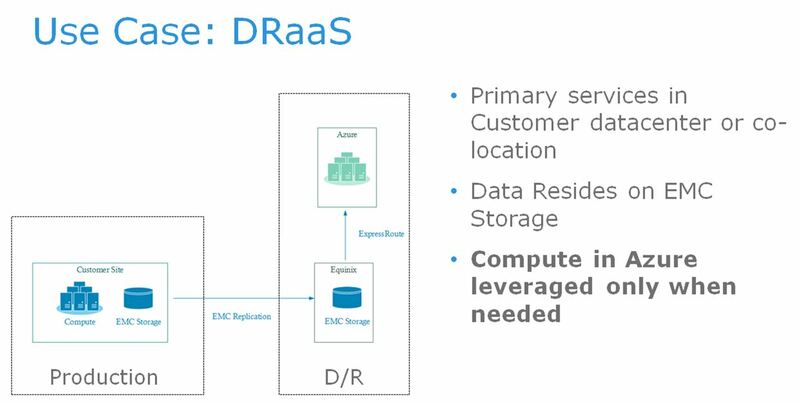 DR as a service allows customers, who may not have a dedicated DR facility, to move critical applications to the cloud. In this case, the data itself would be replicated to an Exchange Provider’s datacenter while the compute component would be replicated to Azure. The advantage of using an Exchange Provider, such as Equinix, for ExpressRoute in this use case is that the customer can create a true DR situation by controlling the replication and storage of their data residing at an alternate facility. Additionally, the compute component can be easily replicated from the customer location to Azure and will be available in a DR event as needed. DR as a Service provides a customer with necessary site protection via the cloud while being both agile and providing data sovereignty. A second use case for ExpressRoute is Business Intelligence. The biggest feature of this use case is the elasticity of the computing environment while maintaining complete data sovereignty. There are two different ways to think about this use case. The data can either be in the customer’s datacenter with the computing nodes lcoated in the Azure cloud, or the source site repository can be replicated to a co-location Exchange Provider with the computing nodes again, in the Azure cloud. This benefit of using Expressroute for this use case is that the data is entirely under the customer’s control while they have a direct, non-public link between the data and the computing nodes. It’s easy enough to spin up a few servers for the big data analytics project that has suddenly popped up making the customer Business Intelligence platform agile and elastic. Another compelling use case for Azure’s ExpressRoute Service is around the topic of End-User Computing. So many of our customer’s today are interested in or evaluating the use of a VDI infrastructure. With ExpressRoute, there is a secure connection between the computing environment and the end user’s data which can remain in the customer’s control. In this case, the virtual desktop will be housed in the Azure Cloud while the user’s file shares, home directory and other user centric data can be stored either in the customer’s datacenter or in a co-location facility. The ease of implementation , management and use of a cloud based VDI infrastructure is compelling and yet the most worrisome component is protecting the end user’s data. In this proposed use case, data sovereignty is intact and within our customer’s full control. In conclusion, it’s important to have the cloud discussion with your customers and more importantly, it’s important to ask your customers what their Microsoft cloud direction is. From a competitive standpoint, EMC loses footprint – whether it’s existing or potentially – for any workload that moves to Azure without ExpressRoute installed. Remember, ExpressRoute allows customers to keep their data in-house and on-site – whether that site is their own datacenter or an Exchange provider’s. 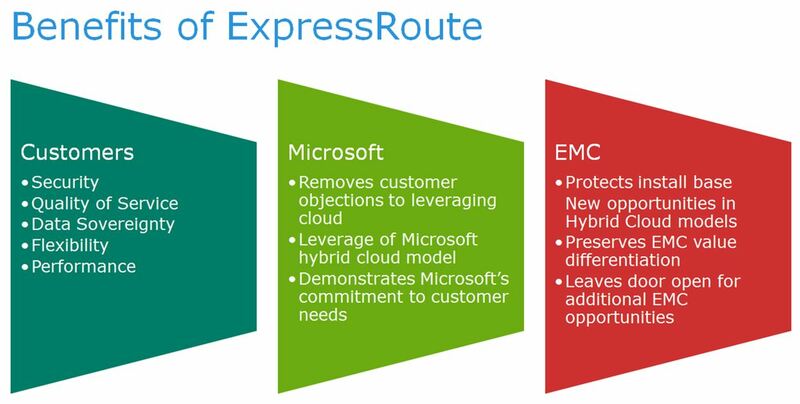 For those customers that use Microsoft based hypervisors, ExpressRoute provides them with the ability to take advantage of the best of Azure services while continuing to leverage the best of our EMC solutions. By having a conversation about their Microsoft goals and explicitly ExpressRoute, you can help your customers with hybrid cloud opportunities while defending our install base and creating new upsell opportunities. This truly positions EMC as the infrastructure leader in ALL clouds – private and public, VMware and Hyper-V.